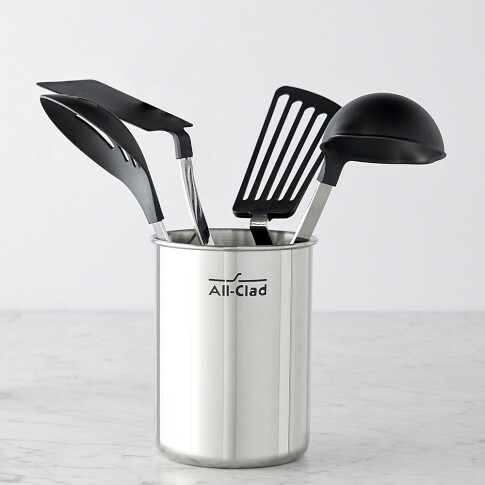 All-Clad's nonstick tools are crafted to the same exact standards as the company's professional-quality cookware. 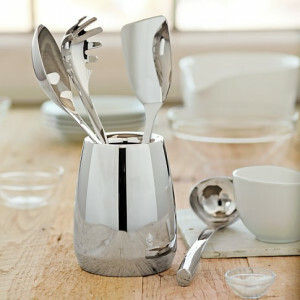 In this set, you'll find a quartet of essential kitchen helpers, along with a handsome stainless-steel storage canister that keeps the tools within easy reach of the cook. 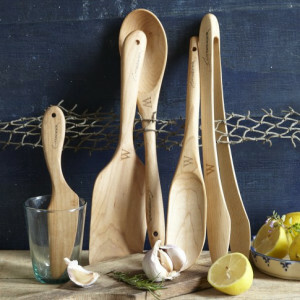 - Five-piece set includes a nonstick slotted spoon, solid turner, flexible slotted turner, large ladle and storage canister. - Sturdy, BPA-free nylon heads are heat-resistant to 475°F. - Polished, heavy-gauge 18/10 stainless-steel handles are exceptionally durable. - Ergonomically designed handles ensure a secure, comfortable grip. - Safe for use with bakeware, electrics, and all cookware, including nonstick.